From left, Wood River Wolf Project members Suzanne Stone and Kyle Coshow demonstrate how to set up fladry at a workshop earlier this summer. Defenders of Wildlife, the program’s sponsor, is seeking to protect wolves not only by minimizing sheep conflicts this summer but also by offering a reward for alleged attempted wolf poisonings out Lake Creek in August. Courtesy photo. It may be near the end of grazing season, but Defenders of Wildlife is still looking to protect wolves through the Wood River Wolf Project by preventing poisoning and by continuing to work toward keeping sheep herds safe from predators. 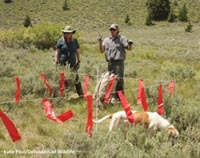 The Blaine County Sheriff’s Office is working with Defenders of Wildlife and the Carey-area Flat Top Ranch to offer a $1,000 reward for information leading to the conviction of the person who poisoned at least two dogs near Ketchum. The first dog, a 6-year-old American Staffordshire terrier named Skylar, died several days after ingesting xylitol-laced, meatball-size chunks of meat that it found while on a hike out Lake Creek with its owner in mid-August. Xylitol is an artificial sweetener that is safe for human consumption and is found in sugar-free chewing gun, but is poisonous to canines. Xylitol became notorious for its potential to poison wolves in 2010, when anti-wolf activist and author of the Lobo Watch blog Toby Bridges urged elk and deer hunters to sweeten gut piles with xylitol. Though Idaho Wildlife Service State Director Todd Grimm said the number of hunters actually using xylitol is probably low, pro-wolf activist Lynne Stone reported in late September that her 12-year-old dog Bo also ingested possibly poisoned meat in the Lake Creek area on Aug. 23. Stone said the dog vomited up the meat and has since recovered. The Blaine County Sheriff’s Office is investigating both cases, Sheriff Gene Ramsey said last week. Suzanne Stone, Northern Rockies representative for Defenders of Wildlife and the program coordinator of the Wood River Wolf Project, said the idea of a reward came up during a season wrap-up meeting last week. John Peavey, owner of Flat Top Ranch, offered to match Defenders of Wildlife’s contribution for a total reward of $1,000. Suzanne Stone said the agencies at the meeting, including the U.S. Forest Service and the Idaho Department of Fish and Game, believe the poisoned meat was intended for wolves. Stone also said it would be disappointing if the poison was intended for wolves, as the community has generally supported wildlife conservation programs such as the Wood River Wolf Project. Stone said Wood River Wolf Project field crews are still sleeping with one band of sheep and will continue to defend them rigorously until the band passes through town next Saturday, Oct. 13. Anyone with information on the recent poisonings near Lake Creek can call the Blaine County Sheriff’s Office at 788-5555.